Considering getting a Russian Blue? The Russian Blue is the blue-blooded feline in the cat world with its lean elegance and aristocratic look. It is considered as one of the most intelligent cat breeds in the world. It is affectionate and loyal to its owners and is known to follow them around the house. Clean, calm, and graceful, this feline makes a wonderful house pet for families provided the domestic routine is consistent. It does not do well in ever-changing environments. It is a healthy breed and easy to groom. A naturally occurring breed, the Russian Blue is said to have first emerged in Arkhangelsk, a Russian port city facing the White Sea. Legend has it that this grey beauty thrived in the Russian wilderness and was hunted for its dense fur. Today, grey cats looking very similar to the Russian Blue are still present in the coldest areas of the country. This feline was previously called “Archangel Cat” in a nod to its place of origin. Its luxurious coat and glittering green eyes reportedly drew the favour of the royalty and the wealthy. As such, it has become the pet of some Russian czars. After sailors took this cat on their voyages, the Russian Blue started arriving at other shores, particularly European ones. It arrived in Great Britain in the 1860s. Then, in 1875, it was featured in one of the first cat shows in the world. The exhibition was held at the Crystal Palace in London, which marks the first time the breed was recorded outside its native country. In 1912, the Russian Blue was entered in competition with other blue cat breeds. It was also the year when the Governing Council of the Cat Fancy (GCCF) gave it its own class and was named “Foreign Blue.” It was also known then as the Maltese. Later, in 1948, this breed’s name was changed to Russian Blue. During World War II, the breed nearly died out as breeders were no longer unable to develop it further. After the war ended, cat fanciers from European countries, including Britain, attempted to save the breed. As there were very few Russian Blues, they crossed the feline with blue point Siamese and British Blue Shorthairs. Eventually, these crossbred traits were bred out of the Russian Blue as it rose in numbers. Its gene pool remains healthy. This breed has a distinctly exquisite and elegant look. It has a lean, medium to large body size with an average weight ranging from 8-15 lbs. The Russian Blue’s body is muscular, long and lean. Its outline is graceful and is one of its distinguishing features. It has a wedge-shaped head that is topped by a pair of large, flared ears, giving this feline a distinctly foreign look. Its eyes are large and emerald green, complemented by high, wide cheekbones. The shape of its muzzle lends the cat a perpetually smiling expression, adding to its appeal. Its tail, the length of which is proportionate to its body, has a faint set of stripes. This breed’s legs are long and finely boned and end in paws that are oval-shaped and small. 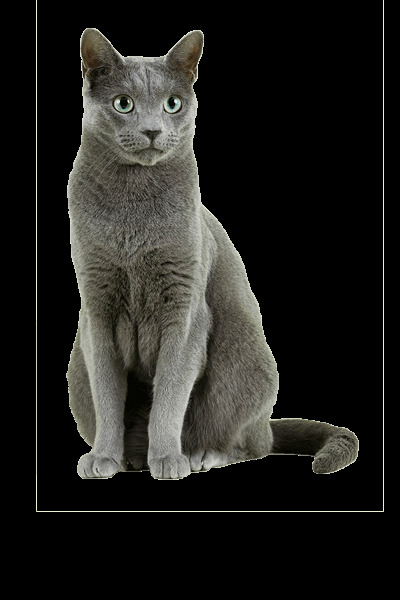 Further, the Russian Blue cat has a lovely blue-grey coat, although the hue is more grey than blue. This breed comes in one colour, pattern, and hair length. However, some Russian cats still carrying the Siamese colourpoint gene may produce black, white, or pointed Russian Blue kittens. Its soft, short-haired double coat has a shimmering effect, thanks to the silver tip of each strand of its fur. Dense and plush, the Russian Blue coat is silky to the touch. This texture distinguishes it from the British Blue Shorthair’s rather “crisp” coat texture. Due to its thick undercoat, this cat should be combed once weekly to keep it healthy and good-looking. The Russian Blue cat temperament matches its elegant looks. It is well-behaved, shy, quiet, gentle, clean, and sweet. It tends to be wary of strangers. It will observe new faces at a distance and only approach once it decides the person is worth its attention. Once it is assured of a person’s friendship, its loyal and affectionate nature will shine through. This feline has dog-like traits in that it is interested in its human’s activities in the home. It will follow its owners around and enjoy a game of fetch. Despite being very affectionate and relishing attention, the Russian Blue is not demanding. It is also not very vocal and when it does talk, it speaks in a “quiet” voice. As such, it is a fantastic companion animal for senior people. It also makes a good house pet as it is good with children, provided that the domestic routine remains consistent. Russian Blues do not like changes to its environment or routine, even with the positioning of household furnishings. 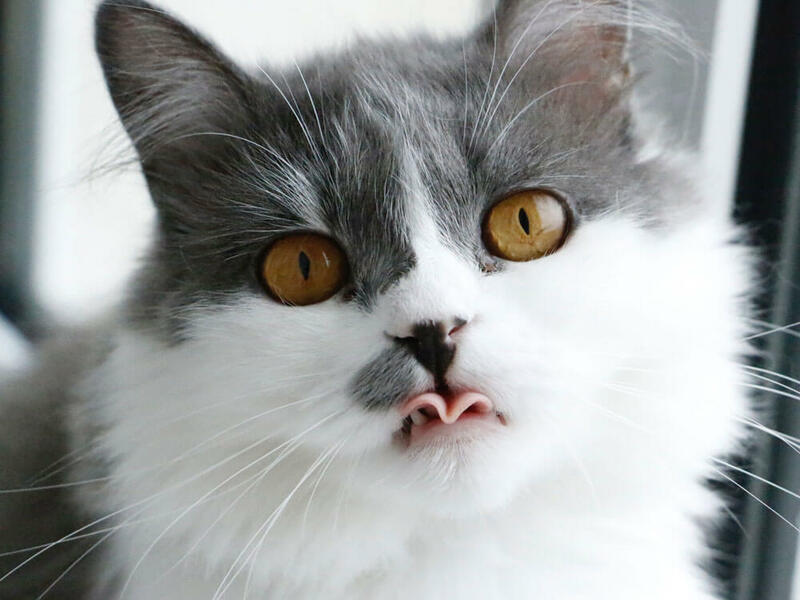 This cat breed is among the smartest. It enjoys mentally stimulating tasks and may even learn to open doors on its own. It has very good memory and can also be taught tricks. Its climbing and leaping skills are also impressive. The Russian Blue cat should be provided with a nutritious diet that fulfils its nutritional needs. It should be consistently given the same food following the same feeding schedule. If there are changes to its diet, those must be done gradually to prevent digestive problems. On average, the Russian Blue’s life expectancy ranges from 15-20 years. This cat breed is among the healthiest and is not known to be affected by hereditary health issues. However, there have been cases of Russian Blue cats affected by bladder stones. As such, it is necessary to check the breeders’ credentials before acquiring a Russian Blue. Further, ensure that this feline gets enough exercise and proper diet to prevent it from becoming overweight. Being an intelligent breed, it should be provided with toys and activities that will also challenge its mental abilities. A pedigreed Russian Blue kitten will cost anywhere between £350 and £800. Average insurance expenses would cost £13 (basic) to £25 (lifetime) monthly. Food costs may range from £15-£20 each month. For vaccinations, boosters, annual checks and other veterinary costs, pet care costs may add up to more than £500 each year. On average, a Russian cat owner will spend about £40-£60 per month. The insurance costs can also affect this estimate. For its lifetime (15-20 years), the expenses can be as low as £7,200 to as high as £14,400 overall. This estimate does not include the initial costs incurred in acquiring this cat. Is a Russian Blue Right for You? This cat is a loyal, affectionate, and gentle pet that thrives as an indoor cat as long as its routine and environment are consistent. The Russian Blue takes time to warm up to strangers and is shy with unfamiliar people. It likes to follow its owner around the house but is not demanding or very vocal. Its dense fur is easy to maintain, only requiring weekly brushings. The Russian Blue is healthy, being one of the very few breeds with no known hereditary health risks.